We have created a board game including a 3D landscape, trees, shrubs and mountains. This board game helps you understand the fur trade. Players overcome obstacles by killing certain animals to obtain and then exchange furs. There are two teams: the Iroquois people and the Huron people. 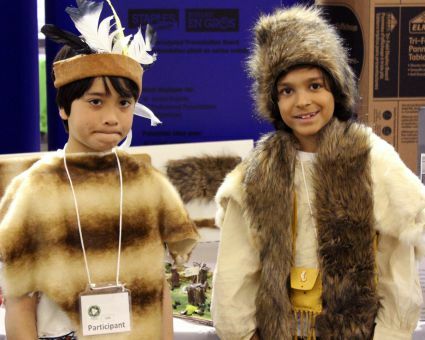 What is the Impact of the Fur Trade on the History of Canada? From the early 17th century to the mid18th century, the fur trade was the most important industry of the territory we now know as Canada. The French and English explorers and furriers were constantly looking for new sources of fur. Why should we be Interested in the Fur Trade Today? The fur trade is one of the main reasons that there is a Canada. It attracted not only explorers and trappers, but also furriers, missionaries, traders and settlers. The fur trade moved from one region to another when furs became scarce. Settlements developed in these regions because of the fur trade. The first fur trading companies were largely responsible for the development of Canada. Jean-Christophe and Evan won the gold medal for grades four/five. Was the Halifax Explosion Important?